Match two of the three series silvers league organised by Ricky Baxter. Great to see all the lads and the final time to get some fishing in before the week that is Stafford Moor! Waggler and bomb rod for across. 3 metre whip line and a margin line. Bait was all natural maggots and casters. No groundbait or pellets today. 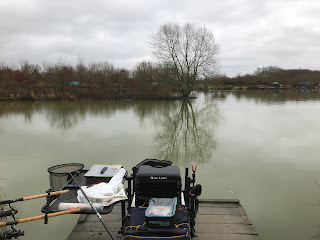 The far bank island was way too tempting so I started on the waggler to try and winkle any of the lakes resident chub by pinging casters across. So the first 30 minutes was spent on the waggler with some small silvers coming, however nothing of note and of course the stocky carp got involved in the action too. Meanwhile I had been feeding the whip line and knew that I could catch fish at a quicker rate than the waggler.